Trichonodosis (also called Trichorrhexis nodosa) is a common hair shaft defect. The condition is typically characterized by knotted hair on the distal portion of the hair shaft, and results in the thickenings or weak points (nodes) due to the hair break off easily. 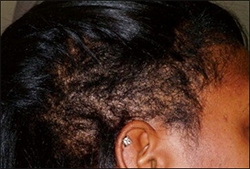 This condition can lead to hair loss, damaged-looking hair, and lack of hair growth. Trichonodosis is basically a ‘focal defect in the hair fiber.’ It results from the absence of the cuticle which encloses the hair cortex in a strong layer. The absence of the cuticle directly exposes the hair cortex to the physical and chemical factors in the environment, and triggers the breaking down of the chemical bonds which are responsible for maintaining the hair structure; thereby making the hair weak. The weakening of the hair means that it can split and fray into minute strands at the point of the breakdown of the cuticle. Overall, in Trichonodosis, the focal disruption of the hair fiber is a main spot for the breakage of the hair shaft. The defective nodes in the hair break easily because of vigorous combing or brushing. Trichonodosis can possibly be caused by genetic factors, although it is believed that environmental factors play a big role in aggravating the condition. The environmental factors which are considered to be directly related to Trichonodosis include aggressive brushing of the hair, excessive exposure to chemicals, and ‘perming’ or blow-drying of the hair. Whitish discoloration of hair at the tips. 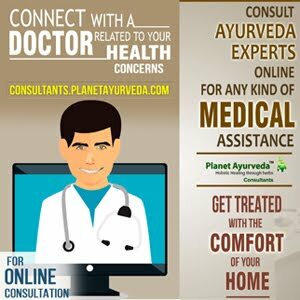 There are some excellent herbal products which are offered by Planet Ayurveda herbal manufacturing company for managing the symptoms of Trichonodosis. These products, prepared from 100% pure and natural herbs, are very beneficial in controlling hair loss and other hair conditions. Hair Growth Formula -- available in the form of capsules -- is an excellent formulation for treating several hair problems. It is prepared from a combination of potent herbs which are traditionally known for their ability to restore the natural growth of hair. These herbs include: Yashtimadhu (Glycerrhaza glabra), Ashwagandha (Withania somnifera), Bhringraj (Eclipta alba), Brahmi (Bacopa monnieri), Bhumiamalaki (Phyllanthus niruri), and Amalaki (Emblica officinalis). The use of Hair Growth Formula can prevent thinning of hair, premature graying of hair, and hair loss. Additionally, this formulation is also beneficial in improving blood circulation to the head/scalp, treating baldness, promoting hair growth, and controlling the conditions which lead to damaged hair. Dosage: 1-2 capsules with plain water, twice daily, after meals. These tablets are prepared from a blend of herbs which can be of immense benefit to Trichonodosis patients. These herbs include Amalaki (Emblica officinalis), Haritaki (Terminalia chebula), Bibhitaki (Terminalia bellirica), Pippali (Piper longum), Black pepper (Piper nigrum), Ginger (Zingiber officinale), Guggulu Resin (Commiphora mukul), Guduchi (Tinospora cordifolia), Vidanga (Embelia ribes), Indian jaap (Ipomoea turpethum), and Red physic nut (Baliospermum montanum). These tablets are useful in treating metabolic disorders, managing hair conditions, treating skin problems, eliminating toxins from the blood, reducing pain and inflammation, purifying the blood, maintaining healthy skin, and supporting the overall health of all organs of the body. Dosage: 2 tablets two to three times a day, with plain water, after meals. This product is prepared from pure standardized herbal extract of ‘Amalaki’ herb (Emblica officinalis). This herb is widely known in Ayurveda for its medicinal value, especially because it is abundant in iron, minerals, calcium, vitamins, antioxidants, and essential amino acids. These capsules are useful in managing Trichonodosis because of their ability to fight against free radicals, treating dryness of skin, managing hair fall, curing skin disorders, rejuvenating the body, supporting the digestive system, and balancing the body’s Vata, Pitta and Kapha energies. For preparing these capsules, some extremely beneficial herbs are combined. The components of these capsules include Amalaki (Emblica officinalis), grape seed (Vitis vinifera), spirulina (Spirulina platensis), wheat grass (Triticulum aestivum), and green tea (Camellia sinensis). These capsules, when taken regularly, can provide nourishment to the cells, remove toxins from the blood, boost the immune system, prevent premature graying of hair, help the body fight against free radicals, treat skin diseases, and manage several health conditions. This oil is an excellent herbal supplement for managing different types of hair problems. For preparing this oil, a number of herbs are used, including Bhringraj (Eclipta alba), Bibhtaki (Terminalia Bellerica), Haritaki (Terminalia chebula) Amalaki (Emblica officinalis), and Brahmi (Bacopa monnieri). The regular application of the oil to the scalp can be very beneficial in promoting hair growth, treating baldness, nourishing the hair, supporting healthy hair follicles, protecting the scalp from dandruff, strengthening hair roots, treating split ends, and maintaining healthy hair and scalp. Method of Application: 5-10 ml of this oil should be massaged gently on the scalp at night, and the hair should be rinsed thoroughly in the morning. This shampoo is prepared from some beneficial natural ingredients including Bhringraj extract (Eclipta alba), Amla extract (Phyllanthus Emblica), Jatamansi extract (Nardostachys jatamansi), Soya protein extract (Glycine max), Aloe vera extract (Aloe barbadensis) and pure honey. The use of this shampoo can increase hair volume, control hair fall, cleanse the scalp, keep the hair hydrated, improve the texture of hair, nourish the scalp, prevent dandruff, prevent itchiness of scalp, strengthen the hair, prevent hair fungal infections, and make the hair soft, shiny and smooth. Method of Application: Massage appropriate quantity of the shampoo into wet hair and scalp in circular motion, and rinse thoroughly. 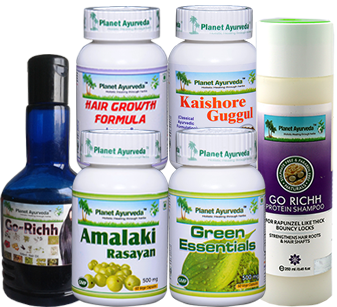 Planet Ayurveda’s herbal formulations for managing Trichonodosis are prepared under the guidance of renowned Ayurvedic experts. These formulations do not contain any artificial colours, chemicals, starch, additives, or preservatives.